"Adopting” a disadvantaged child or family at holiday time can inspire a sense of giving in your children. Follow the instructions below to support a low-income child or family without enough resources to have gifts for the holidays. A list of gift options* for your “adopted” child or family. The courage to face a shopping expedition with your children! Contact your local Catholic Charities, Lutheran Social Services or Salvation Army or visit volunteermatch.org to be matched with your recipient(s), ideally similar in age to your own children. After you learn the specifics about your recipient(s) (age, gender, etc. ), brainstorm gift ideas with your family. If the organization gave you a list of requested gift items, consider that, too. Pick your destination and go shopping. Wrap the gifts and attach recipient names to each. Drop them off at the designated spot. What are other ways you can help cheer up families in need over the holidays? Does giving in this way make you look at your own holiday gifts in a different way? How or why not? How the Grinch Stole Christmas by Dr. Seuss (Random House, 1957). A timeless tale about what Christmas is really about. The Berenstain Bears and the Joy of Giving by Stan and Jan Berenstain (Zonderkidz, 2010). Ages 4 and up. Brother and Sister Bear are eager to receive their Christmas presents. But during the Christmas pageant, they learn a valuable lesson about generosity. 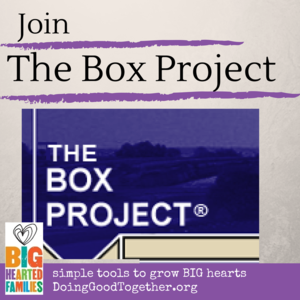 If you enjoyed this project, you can sponsor a family year ’round through the Box Project or Family to Family. If you’d like to purchase gifts for more children, take part in Toys for Tots. Check out these other great ways to provide comfort throughout the year?